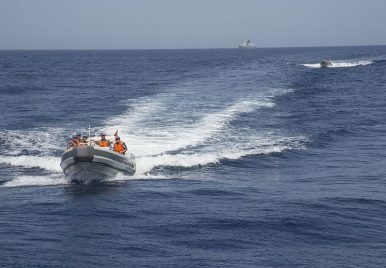 A People's Liberation Army (Navy) boat transits toward the guided-missile destroyer USS Mason in preparation for a U.S.-China counterpiracy exercise in the Gulf of Aden (August 23, 2013). This article is the second in a serious of four that will explore the nature of China’s growing presence in the Middle East and what China’s increasing leadership means for the region’s economic, humanitarian, and security situation. The Obama administration’s “pivot” to Asia and away from the Middle East, followed by current President Donald Trump’s “America First” approach, has seen U.S. attention on the region recede outside of security interventions, admittedly despite Trump’s focus on increasing trade ties with Saudi Arabia. In recent years, the security focus of the U.S. presence in the region was an ideal situation for China, as it enabled Beijing to focus solely on becoming a larger economic player in the Middle East while the United States provided the security necessary to enable Chinese investments to flourish. China’s global presence has traditionally been defined by heavy economic investment and a negligible security and political presence, meaning the above situation allowed Beijing to play to its strengths. As a developing country itself, China is loath to expend resources by adopting any of America’s mantle as the regional security guarantor, instead focusing on pursuing avenues that directly serve its economic development. This is all in line with China’s policy pillar of noninterference in the internal affairs of other states by which Beijing has proudly defined its relations with the developing world since 1955. Beijing’s push to fill some of America’s abrogated economic leadership in the Middle East was reflected in the July 2018 China-Arab States Cooperation Forum. Here, Beijing elevated its relationship with the Arab world to a “strategic partnership” by emphasizing that it plans to leverage economic development to combat the security and humanitarian issues of the region. A financial consortium between Arab and Chinese banks, backed by a $3 billion fund, has already been established to facilitate this development, with specific focuses on oil and gas, nuclear, and clean energy. Increasing Chinese leadership in the Middle East is served by a growing interest among the region’s states to pursue the “China Model” at the expense of the “Washington Consensus” that has traditionally defined foreign economic presence in the region. The Washington Consensus, defined by Western value-oriented free market economic ideals and supported by U.S.-dominated institutions like the IMF and World Bank, is losing traction among Middle Eastern regimes due to the ideological and political baggage that accompanies it. Indeed, the political environment of the Middle East, defined largely by authoritarianism and state-centric governance modes, is naturally aligned with the China Model. The China Model – characterized by a strictly controlled political arena, as well as state control of the economy’s commanding heights, accompanying market capitalism – resonates significantly with Middle Eastern governments. Despite the fact that Middle Eastern regimes have largely proven incapable of achieving the state capacity, industrialization, and institutional structures imperative to the success of the China Model, the appeal of Beijing’s economic alternative is likely to remain a source of Chinese soft power that consolidates its economic influence vis-à-vis the US in the Middle East. Becoming Entangled in Regional Security and Geopolitics? As alluded to in part 1 of this article series, the scale of Chinese Belt and Road Initiative (BRI) combined with U.S. rollback of its active military presence means Beijing will be pushed to increase its security presence in the Middle East. Signs of Beijing becoming a bigger security player in the wider region are already apparent, including the establishment of a Chinese military base in Djibouti and Chinese naval involvement in counterpiracy efforts off the Horn of Africa. Looking ahead, there are a number of factors that will continue to complicate the future of the noninterference paradigm within China’s Middle East presence. The typical Chinese approach to security issues in the Middle East has been one of disengagement on an individual level, with multilateral diplomatic channels like the UN Security Council preferred, as seen in the Iran nuclear deal. However, as China increases its presence as a leading power in the Middle East, the region’s states will be less willing to accept Chinese neutrality on polarized sensitive issues. Accordingly, the traditional Chinese paradigm of aiming to use economic development as the sole means of pushing for regional harmony is gradually receding. Recognizing the growing expectations on it as a global power, and recognizing that it has increasing skin the game due to its regional economic investments, China has been sticking less and less to its traditional approach of nonalignment and disengagement regarding security issues. In fact, the advent of BRI may continue to push China away from its traditional objective of decoupling trade and economic presence from a politico-security presence, as one of the central tenets of BRI is using economic leverage to serve Chinese political and strategic goals. Expectations from Middle Eastern states aren’t the only source of pressure on Beijing to increase its security and political footprint in the region. China’s rise as a global power has been accompanied by rising domestic expectations among the Chinese people for Beijing to play a more assertive and engaged role on key international issues and in international hot spots. Key domestic players here are the Chinese state-owned enterprises (SOEs). The SOEs argue that Beijing needs to pivot away from its nonintervention approach and increase its engagement, with the aim being to increase Chinese leverage across the Middle East and North Africa region regarding pricing and supply contracts. Furthermore, the fact that around 550,000 Chinese nationals are located in the Middle East – a figure representing around 10 percent of all China’s expatriates – means that Beijing is being pressured to have the security presence necessary to ensure their safety. Preferring to keep as soft a military presence as possible, Beijing’s security footprint in the Middle East will likely remain relatively similar to that seen in the past couple of years, for example: engagement in multilateral efforts like the counterpiracy task force off the Horn of Africa; peacekeeping efforts like that seen in South Sudan; and the deployment of security contractors. The position of Saudi Arabia as China’s largest Middle Eastern trading partner alongside Iran’s increasing importance to China as an indispensable asset for the BRI means that China is being forced to maintain an increasingly less feasible balancing act between the two ardent rivals. Beijing has assiduously worked to maintain a delicate balance with both sides, for instance by making a point to conduct a joint counterterrorism exercise with the Saudis in 2016 after holding a joint naval exercise with Iran earlier that year. While Saudi Arabia is a major economic partner of China, Iran is both an economic as well as strategic, or security, partner. Beijing’s 2016 announcement that Sino-Iranian ties had been upgraded to a “comprehensive strategic partnership” was a salient development, especially considering that such titles carry vast meaning in Chinese diplomacy. The rise of Sunni militancy across the Middle East and Central Asia is a rising pressing security concern for Beijing, given its neuralgia over signs of militancy among the Muslim Uyghur population in Xinjiang. Considering that Saudi Arabia played a key role in facilitating the rise of Sunni militancy, Beijing views it as a less credible actor in combating the phenomenon than it does Iran. The increasing prevalence of Tehran vis-à-vis Riyadh in Beijing’s designs are further compounded by the fact that Iran is far more of a critical node in the BRI than Saudi Arabia, despite the fact that plans have been announced to align the initiative in Saudi Arabia with Crown Prince Mohammed Bin Salman’s Vision 2030 plan. The moves China is making to pave the way for Iran’s accession to the Shanghai Cooperation Organization are a further development in that direction. In terms of the global great power game, Iran also holds more weight for China than Saudi Arabia. Beijing’s policy stance is that its interests are best served by the existence of a non-U.S.-aligned bloc alongside a pro-U.S. bloc in the Middle East, in order to create a balance of power more navigable for China. The need to develop the non-U.S.-aligned bloc in order to even the balance and prevent U.S. dominance in the region leaves Saudi Arabia – a close regional partner of the United States, unlike Iran – less important in such designs. As China’s primacy in the Middle East continues to expand, it will become increasingly likely that Beijing will no longer be able to court both sides of the Riyadh-Tehran rivalry, especially as that confrontation increases to gain steam. Looking Ahead: Follow the Money? While China’s political-security presence in the Middle East may be growing, this engagement is driven by economic interests and not by goals of norm promotion like that seen in the historical U.S. presence. Such engagement from Beijing – aside from efforts to undercut Uyghur militants in the Middle East – will likely extend to the bare minimum necessary to protect and facilitate Chinese investments (which part 3 of this series will explore). Therefore, as China’s leadership in the Middle East continues to grow, Beijing will likely look to manage increasing regional expectations on it to invest political skin in the game by pursuing a mediation approach regarding issues like Israel-Palestine and the Saudi-Iranian rivalry in order to realize its role as a responsible power. The confluence of these various security, economic and political dynamics mean that the Middle East is accordingly positioned to be a key setting where China’s envisioned paradigm of global leadership will be advertised.